First, I have to say it has been a bit shocking today with the news of Farrah Fawcett and Michael Jackson. I have quite a few memories of both of them... I was a huge Charlie's Angels fan and even had the barbie dolls of each of the original Angels. I memorized Thriller when it first came out but, never quite figured out how to moonwalk. Regardless of how you feel about either of them in recent years, they definitely made their mark when they were young and among the hottest celebrities. My heart goes out to their families during this time. Back to our regular programming... yesterday was my birthday! No, I'm not telling my age but I am getting closer to a milestone that I'm not quite ready to admit to just yet. My Husband not only treated us to dinner at a local restaurant that we enjoy (and they had a decadent mocha chocolate cake that I had for dessert! ), he proved he DOES listen when I mention things I'd like to own. He gave me the pasta roller attachment set for my KitchenAid stand mixer, which I was completely thrilled to receive! I didn't let it sit for long before using it... barely 1 day! As you can see from my previous attempts HERE and HERE, I am getting a bit better at it each time. With my new attachments I found it much easier to manipulate the dough using both hands while the machine did the work. I was able to get the dough nice and thin, which I found difficult with the hand crank machine. With this attempt I was armed with a copy of Essentials of Italian Cooking by Marcella Hazan. This book was recommended to me by one of my Twitter friends, @constablesblog. The section on homemade pasta shared several helpful tips when preparing homemade pasta. The most helpful one I found was allowing the dough to sit and dry slightly before sending it through the noodle cutter attachment. This made a big difference when I was using the spaghetti/angel hair attachment. When I tried this with the hand crank machine, I was sending it through without allowing it to sit and it gummed up the machine. Very frustrating and really awful results. Not the case this time! Both of My Boys said that they LOVED my noodles and kept asking for more! I thought they definitely had a pleasing light texture. I think my next pasta challenge will be to make ravioli. I need to decide on what filling I want to try first. With the roller attachment, I feel confident I will be able to pull it off with great success! Happy belated birthday - what a great gift!! That pasta looks amazing. I love homemade pasta. Definitely worth the extra work. With ravioli (and lasagna) it really makes a difference. How about roasted squash and pine nut ravioli? Great photo! Love the fork shot! Happy Birthday, Patsy! That's a cool gift that your hubby bought you- the pasta is perfect looking!It looks like a professional made it! I am so jealous - I want the pasta roller! Your pasta looks amazing! Happy birthday to you, again! I can tell already that you had a great day. Happy birthday!!! What a great gift. Your pasta looks amazing, that is on my list of things I want to learn. Happy birthday to you Patsy! I'm guessing your a decade younder then I Because I'm coming upon a milestone BD and I was way over my huge Barbie addiction by the time the Charlie's Angels Barbies hit store shelves. 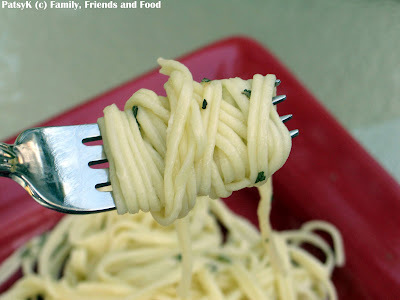 Your pasta looks perfect and very useful tool you got indeed. Hope your day was special in every way! Ok, how much for a batch of homemade pasta? ;) Happy belated birthday! Mmm, molten cake... sounds like Chilis? Hope it was a good one! Try spinach pasta sometime. I love it! I have the KA pasta attachment too and LOVE it. It is sooo nice to make your own pasta. However did you nitice that when you use the spaghetti attachment the noodles dont seperate? They stick 2 together? Or is it just mine? Happy Happy Birthday! What an amazing looking pasta dish - yum!